During his long political career Tony Benn went through many incarnations: pillar of the Labour establishment, Cabinet minister, tabloid bogeyman, and serial dissident…national treasure. Former Labour minister and fellow diarist, Chris Mullin, for 35 years one of one of Benn’s closest friends,offers a sympathetic but not uncritical assessment of one of the most significant politicians of the post-war era. 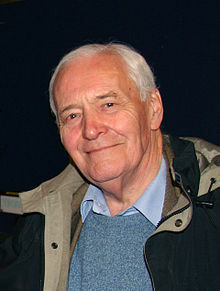 Tony Benn was a British MP for 47 years. He died on 14th March 2014 at the age of 88. Benn led an eventful life, he enlisted in the Royal Air force during the Second World War. He had to renounce his hereditary peerage in 1963, in order to take a seat in the House of Commons, which created huge sympathy for him as he had been denied a seat in spite of coming first in an election. He opposed entry to the Common Market, served as Chairman of the Labour Party as well as in several cabinet posts and stood a few times for the leadership of the Labour Party. Tony Benn was a colourful politician, always in the thick of the action and controversy, very much as a leftwinger in the Labour Party and he loved to debate. As President of the “Stop the War Coalition” against the invasion of Iraq he spoke at what was probably the largest march/demonstration ever to take place in Britain in 2003. Tony Benn has left behind a huge library of published diaries of his activities, books and texts of speeches.